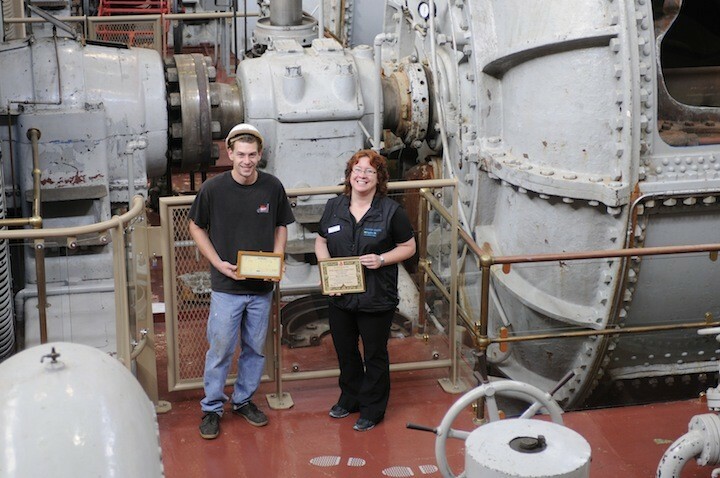 Janis Schultz celebrates a decade working at the Stave Falls powerhouse in Mission, the latest in a long family line. As Janis Schultz strolls the large building that contains the Stave Falls hydroelectric powerhouse, she is eager to point out facts and memorabilia that have surrounded her for the past decade. Here is a helmet that her granddad wore when he worked at the plant. Here’s the Tesla coil, one of many interactive electricity displays at the mini science centre. And here are the giant hydroelectric turbines that were featured in productions such as X-Men 2 and the X-Files. The plant is in Schultz’ blood. Her great-grandfather, Albert Miller, helped construct it in the early 1900s. Her grandfather, Charlie Miller, worked in it for three decades, starting in the ’30s. Schultz herself is celebrating her ten-year anniversary as a tour guide at the centre. And both of her adult children have volunteered with the Haunted Powerhouse, a haunted house event that used to take place at the station. Schultz unquestionably loves her job. She loves being a tour guide, loves teaching kids. Loves running into people with a connection to the place. “It’s a fun job. It doesn’t feel like going to work, because every day is different. You meet people from all over the world. You meet people who used to work here, or maybe they worked at new Stave, or maybe they worked for another part of B.C. Hydro or B.C. Electric. Or maybe they grew up here,” said Schultz, who now lives in Mission. Schultz guides about 300 students, Grades 6 and 9, through the centre every week. But there’s a steady stream of people of all ages who wander in to see what it’s all about. Schultz has had employees from decades past drop by for a tour. The powerhouse was constructed from 1909 to 1925. At its height, the station had the potential to produce 52.5 megawatts of electricity, enough to power 25,000 homes. It achieved this by pumping 2.8 million litres of water through its four turbines every minute. Schultz’ family grew up going to the power plant on school tours, and hiking the nearby trails. Many have also worked at the Ruskin dam and powerhouse a few kilometres down the river. Granddad Miller became a well-known character in the community. The avid angler taught other Stave Falls workers to fish during lunch breaks. He later chronicled the history of the area in two books. His smiling face is in several albums throughout the centre. On her tours, Schultz teaches kids about electricity and conveys a message about conservation. BC Hydro has declared October to be Power Save Month, when residents switch on their heating and become more sensitive to their hydro bills. The Stave Falls station was decommissioned in 2000, when it was replaced with a smaller, more efficient, and more powerful one across the road. The new one still uses the same damming system. The original Stave Falls seems to retain its past by haunting the present occupiers. “It is haunted,” Shultz insists. Her son agrees. Jensen helps paranormal groups set up infrared cameras and audio recorders to catch evidence of changing shadows and lights when no one is around. Schultz says she has heard footsteps, and that there is a ghost dog. It is easiest to hear the pup between 3 p.m. and 6 p.m., they say. “This place seems to be reliving its past,” explained Jensen of the mysterious phenomena. Stave Falls visitor centre closes for the season on Oct. 20, 2013.